Senior Treasury Analyst - Financial Risk at Bombardier Transportation - The Treasury Recruitment Co.
We are delighted to be recruiting for a Senior Treasury Analyst – Financial Risk for Bombardier Transportation, a global leading manufacturer to within transportation. 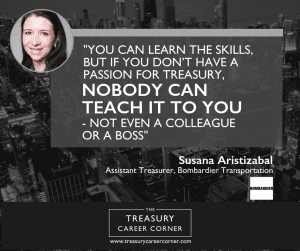 In our most recent Treasury Career Corner Podcast, Susana Aristizabal, Assistant Treasurer at Bombardier Transportation talks about her career to date and where she see’s the future of Treasury heading. Not only that, Susana discusses her time at Bombardier and why it is such a great place to work, along with many other interesting topics! A very worthwhile listen for anyone interested in the position in this job advert, or in fact any role at Bombardier Transportation! Simply go to www.treasurycareercorner.com to hear Susanna talking all things treasury! Anyway, you want to know more about the role, right? As a member of the Financial Risk Management Team based in Berlin, Germany, you will ensure that the Financial Risks of the group are correctly identified, reported, hedged and accounted for, in accordance with policies, directives and accounting principles in place. Provide analysis and support regarding FX risk in bid phase, by assisting bid controllers and coordinating with Structure Finance/Tax/Contracts/Procurement/Sales as required. Request derivative contracts based on all cash flows reported in FX Planner tool, including initial hedges and/or rolling of hedges, spot transactions, and Fair Value hedges for BTFS. Identify appropriate hedging strategies, request their implementation, and ensure proper and timely implementation of hedge requests. Systematically track exposure against hedges to minimize under- or over-hedging. Monitor legal entities bank balances and correct errors in a timely manner. Enforce policies and procedures to minimize impact on financial results due to FX volatility. Support business partners in Finance with Hedge Accounting: Calculate the respective accounting entries and ensure reconciliation with local accounting as well as contract accounting if applicable. Produce the quarterly reporting kit for BT Finance and for auditors’ requirements. Prepare regular reports on Financial Risk at BT: Potential Loss Report, CDS Monitor, Benchmark report, Forecast FX impact in BT financial results, amongst others. Schedule, coordinate and provide regular training on Financial Risk policies, processes, accounting principles, and tools (including Quantum). Support local management in formulating appropriate action plans to address gaps related to financial risk and/or accounting practices for FX. Ensure compliance with OSC, CASRA and all applicable accounting principles: Maintain directives, Desktop-procedure and User-guides up to date. Ensure compliance with internal policies, directives and procedures, as well as any Service Level agreement in place. The ideal candidate will have a Finance degree within Finance or Accounting and have 5+ years of relevant experience in Treasury departments in quantitative/analytical role, in a Corporate setting or at a Financial Institution. You will also have strong oral and written communication skills in English, with good knowledge of German and/or French considered an asset. Strong knowledge of FX transaction risk, hedging strategies and hedging instruments used to cover this risk. Basic knowledge of interest rate risk and commodity risk, hedging strategies and hedging instruments used to cover this risk. Good knowledge of hedge accounting norms, in particular IAS 39/IFRS9. Advanced skills in EXCEL a must: including proficiency to work with macros, statistical tools, and large amounts of data. Knowledge of SAP is considered an asset. If you are interested in this brilliant opportunity with a truly fantastic global leader, please send your CV to dan@treasuryrecruitment.com or call Dan Welham on +44 203 603 4448 to find out more.